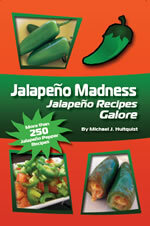 We have a number of jalapeno pepper themed cookbooks and we're working on our next cook dedicated to habanero peppers. Come back soon, or add your name to our mailing list and we will notify you when the Habanero Madness Cookbook is ready! Habanero Madness - More than 100 recipes incorporating the awesome habanero pepper. Powerful Starters, Sizzling Side Dishes, The Flaming Main Course, Savory Sauces and Spreads, Homemade Habanero Hot Sauces, Scorching Salsas, Sweet and Spicy, Vinegars and Infusion, and More. BRING ON THE HABANERO HEAT! Jalapeno Poppers and Other Stuffed Chili Peppers! Do You Crave Jalapeno Poppers? Do You Love Chili Peppers? Do You Need Party Meal Ideas? 100+ classic and original jalapeno popper and stuffed chili pepper recipes and more! If you love jalapeno poppers, you'll love this collection of recipes with notes on coring, breading, sauces, stuffing ideas and more, along with unique recipes and those you've seen in restaurants. 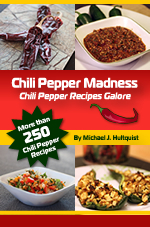 Order Our Jalapeno and Chili Pepper Madness Cookbooks Today at ChiliPepperMadness.com! Looking for Habanero Pepper Recipes? Click Here!